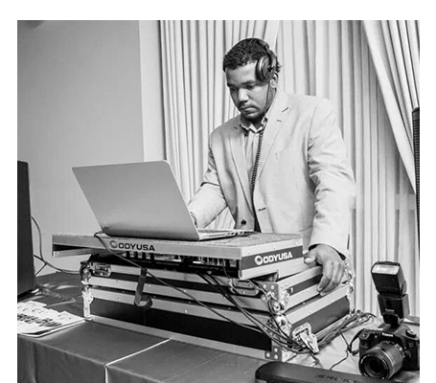 DJ Jean Jacques is devoted to providing outstanding service and delivering professional entertainment at your celebration, ensuring that every guest enjoys your event. DJ Jean’s number one priority is to deliver the entertainment that you envision for your special occasion. With his pleasant, energetic, and very personable manner, your taste will certainly be accommodated. You call the shots, Jean will provide the entertainment, and together the party will be ignited. Jean is well-experienced in providing professional disc jockey entertainment at weddings, dances, bar/bat Mitzvahs, corporate events, and other private parties. Jean can host any event as a DJ, MC, Dancer, and/or Interactive party motivator. Jean has a broad knowledge of music spanning from the sounds of the Caribbean from Soca, Reggae to all the Latin Genres. Jean presents himself as a well educated, caring, helpful, and fun entertainer open to any party’s vision. Jean is very versatile and able to please many different crowds. Jean can read any crowd and predict what music will work in any situation. He will provide a nice blend of music with smooth transitions from any generation to the present. Jean is also very considerate of requests made by your guests, seamlessly blending them in to the song list provided, but only when appropriate. Jean’s music taste are worldwide. His knowledge of music extends across Big Band, Swing, Ballroom, Motown, Salsa, Merengue, Bachata, Modern and Classic Rock, Country, Top 40, Hip-Hop and R&B, Reggae, and Soca. Born and raised in Haiti, Jean is also an expert in Kompa and Zouk, two distinctively Caribbean sounding music styles. 2 Self-powered Behringer and 2 QSC speakers, 1 Mackie sub-woofers, 2 Toshiba laptops running PCDJ Reflex, Dennon mixer, Pioneer DJM 700 mixer, Numark CDN-88 dual deck CD player, 2 Pioneer CDJ 350, Pioneer DDJ- SX controller, Shure wireless microphone, Stanton headphone, Odyssey case. Very professional, well dressed, and knows how to work a crowd! I have a lot of Caribbean family and friends, and American friends…everyone had a blast at my wedding! He even Encourage me to do my surprise performance when I was trying to chicken out!!!!! Thank GOD I did it, EVERYONE LOVED IT!!!! Copyright© 2016 Eclectic Entertainment. All Rights Reserved.